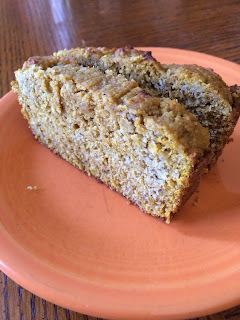 Laura Schmitt NE: Pumpkin Bread Gluten Free Sugar Free Dairy Free Oh my! Pumpkin Bread Gluten Free Sugar Free Dairy Free Oh my! This recipe is so close to a traditional pumpkin bread that you can serve it to all guests without them knowing they are eating a much healthier option! By removing the sugar and adding protein and fiber rich almond flour and coconut, we can enjoy pumpkin bread again! Mix ingredients together and bake in 2 7-8" bread pans for aprox 25 minutes, or until bread begins to brown a bit and bounce back in the center when touched. Bake at 350 degrees F.
Note: this is not as sweet as a traditional pumpkin bread, so if you feel like you need more of that sweet taste, I advise making a simple icing with powdered Swerve (erythritol) and water and drizzling across the top of the cake.